Mykonos is a cubist painting with white buildings, golden beaches covered with bronze bodies. Mykonos is young, hip and hedonistic with a touch of bourgeois. Over the years, it has gone from sleepy fishing villages, to jetset, to hipster haven and is now settling into more mainstream tourism. Perhaps too crowded for some at times, Mykonos is nonetheless an essential part of the Greek Island experience. 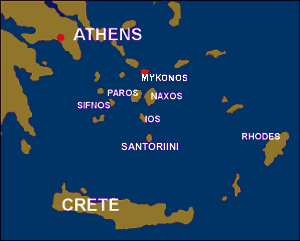 Mykonos is 96 miles from Athens by air.